I am a BzzAgent and as such I am sometimes sent products to test and review. If you don’t know what BzzAgent is check out my review here. I was thrilled when a box arrived last month with full size bottles of Frederic Fekkai Shampoo and Conditioner for me to try! I am a girly girl at heart and love trying new beauty products so I excitedly popped these open. I was sent the Glossing Shampoo & Conditioner which did exactly what they say they will do: they made my hair shiny and super healthy looking. The shampoo and conditioner are made with real olive oil so they make the hair shiny and healthy by improving the quality of the hair, not by covering the hair shaft in silicone like some other glossing products do. These are conditioning so they are a bit heavy for my oily hair, but I solved this by only conditioning the ends of my hair, leaving my scalp alon so my hair doesn’t get flat. My hair was really soft. I didn’t expect this but the Glossing Shampoo & Conditioner made my hair so touchable and soft, I just wanted to pet myself. Even during the day it was soft and stayed untangled. The Glossing Shampoo & Conditioner rinsed out cleanly and smelled great. They don’t have a heavy perfume-y smell and have a soft pleasant scent instead. 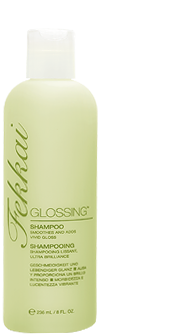 This is a salon line by renowned stylist Frederic Fekkai and you can buy it in salons, online at the Fekkai website, and at specialty retailers like Ulta, but it’s also in drugstores. I think that it’s great that this line is available in drugstores so I can use my Rite Aid +Ups or CVS ExtraBucks to pay for them! The bottles retail at $21 for 8oz or $35 for 16oz. Now, that is more expensive than I usually would pay but you don’t use much and it will last. I think that the products are definitely worth a try because any beauty product that works for you and keeps your hair healthy, shiny, and soft is one you want to have around.